Link to full size image. 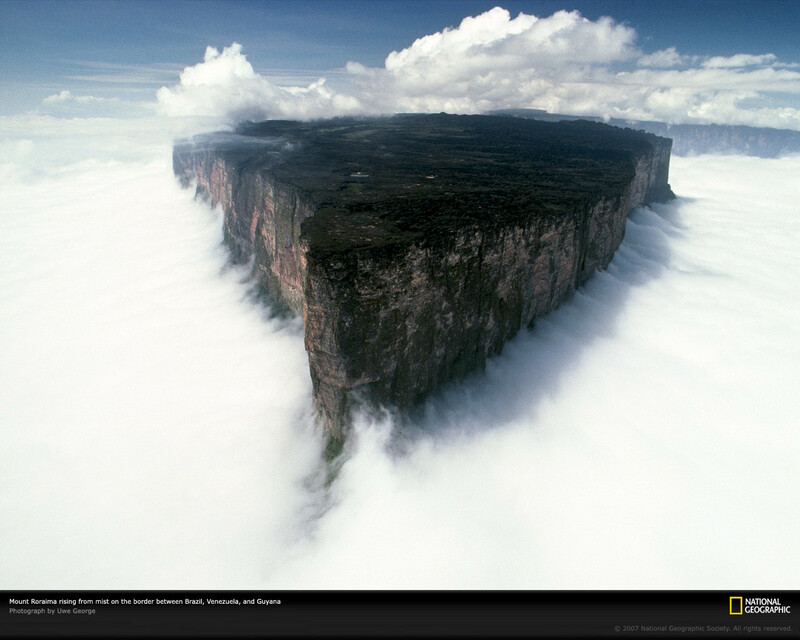 Mount Roraima is the highest point in Guyana, the plateau standing at 2700 m with the peak at 2810 m in Venezuela. Roraima is the tripartite border of Guyana, Venezuela and Brazil, and at the moment can only be approached from the Venezuelan side. Part of the ancient Guiana Shield, which extends into Brazil and Venezuela and was once part of Gondwanaland before tectonic activity moved apart the continents of Africa and South America, Roraima has developed unique flora which huddles for shelter in pockets on the exposed, windswept plateau. Amazing rock formations have been carved by wind and water, and the ground is uneven and rocky with frequent crystal clear pools of excruciatingly cold water (good for the circulation apparently!) There are crystal beds that contain large, individual crystals in interesting shapes, and stunning views from the top over the Gran Sabana of Venezuela, provided the cloud cover lifts. A good guide should give you the opportunity to see all of these features once on the top.